“Welcome to Wall Street,” said the investment banker. The year was 1989, and my college’s financial club had organized a trip to the New York Stock Exchange. Our guide led us to the floor of the exchange because, back then, that’s where all the action took place. Orders came flying in by phone, and some people even had portable devices to keep track of their stocks on the go. As the open got closer, the noise rose to where you could barely hear the person standing next to you. But that was nothing compared to when the minute hand of the clock struck 9:30. The minute we heard the “ding, ding, ding” of the opening bell, it was pure pandemonium. Today, the floor is a little less exuberant, being mostly there for show now that a good portion of today’s trading takes place via computers. But even though Wall Street’s essence has remained the same since it began in 1792, I believe its glory days are numbered. See, Wall Street still has a monopoly on one essential part of trading … but in time, the internet is going to wipe out this current advantage. Right now, Wall Street is made up by an army of middlemen. These are your investment bankers, securities exchanges (like the New York Stock Exchange and the Nasdaq), corporate lawyers, analysts, consulting companies, auditors, accounting firms, rating agencies and all-around paper pushers. These entities exist for one main purpose: to help sell equity or stock to the public. So if you want in on the action, you have to go through this vast network. And for this monopoly, you pay a heavy price. According to PwC, an elite consulting company, investment banks charge a 5% to 7% fee to do an IPO, or initial public offering. This is the first time that a company’s stock is offered for sale to the public. That means if your company’s IPO is worth $1 billion, investment bankers net as much as $70 million in fees. According to a survey of registrations filed by the Securities and Exchange Commission — an arm of the government that regulates stocks — the average cost of these middlemen’s fees amounts to $3.7 million. While that may sound like a lot of money to you, I actually believe that this average is way too low. Bottom line: It costs way too much to become a publicly traded company today. The best evidence of this is the lack of IPOs. 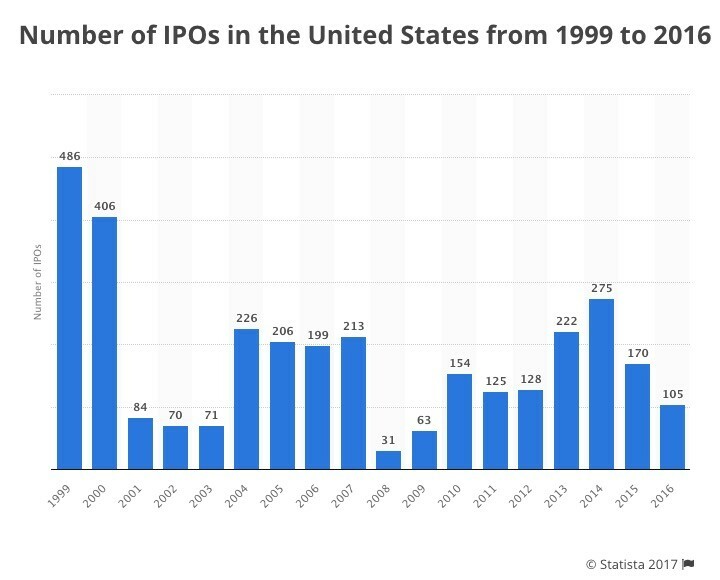 After peaking in 1999 with 486 companies going public, IPOs have since crashed. In 2008, just 31 companies became publicly traded. And 2016 marked the lowest number of companies going public in nearly a decade, with only 105 IPOs. It’s clear that more companies are choosing to stay private longer. But now, these companies will have a new way to get their shares and stock to people wanting a slice of the pie. This new process is called an ICO/ITO, or initial coin/token offering, which is being popularized by cryptocurrencies. Basically, this is the process of digitizing an asset to make it publically traded via the internet. And if used to sell stocks, this process has been shown to dramatically reduce costs. According to one Quora user, an ICO can be done for as little as $100. On the high end of the spectrum, an expensive ICO might cost $300,000, said a lawyer on the same site. That’s still peanuts compared to the $70 million an investment bank will charge your $1 billion company. Or the lowball $3.7 million estimated fees you’d pay an army of middlemen to do an IPO. Now, to my knowledge, no one has gone this route yet. But the dramatic cost reduction in doing an ICO/ITO offering vs. an IPO means it’s only a matter of time before someone tries this method out. And once a successful model has been built, it’ll be curtains for Wall Street’s current IPO business. That’s one of the reasons I’m staying away from traditional Wall Street companies in my services. Instead, I’m looking for companies that are going to benefit from the new school of finance — be it through ICO/ITOs, mobile payments or even the implementation of blockchain technology. These trends are the future of investing, and they’re what I research in my flagship Profits Unlimited newsletter.